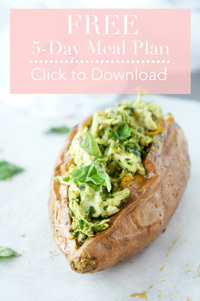 You might be noticing a lot more “mini” foods on the blog these days. I’ve discovered this new passion for testing out new miniature-sized recipes on my 7-month old Leo. We’ve been trying out the baby-led weaning approach with him and I’m so proud of how well he’s doing with all the new flavours and textures we’ve been introducing. We decided to initially start him off with vegetables and more savoury flavours so that he would get used to those tastes before exposing him to foods on the sweeter side. Now don’t get me wrong, I have absolutely nothing against fruit, but I know if given the option, most kiddos (and adults) would gravitate towards fruit over vegetables and ideally I’d like him to be a lover of both! So once we experimented with some spinach zucchini frittata fingers, mini salmon cakes, sweet potato lentil tater tots and some roasted butternut squash, I decided to offer him something a little more fruity. 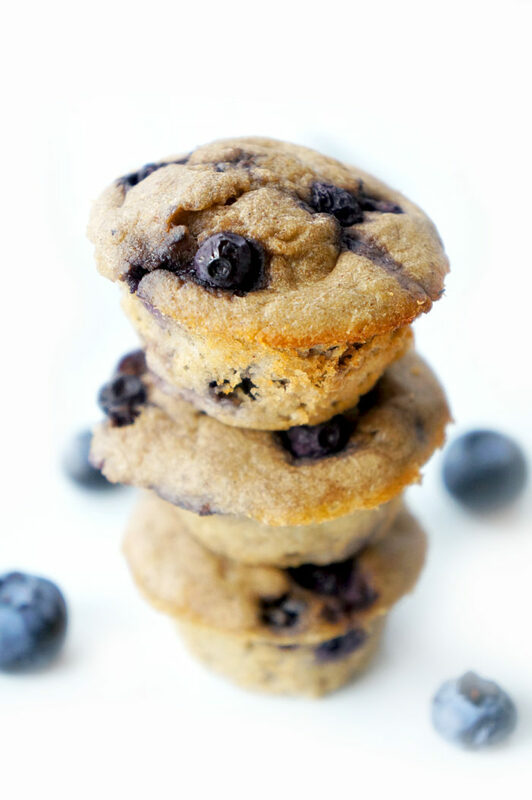 And these mini blueberry banana muffins were at the top of the list! I’m all over using the mini muffin tins these days since it produces the perfect sized bite for Leo’s little hands to hold. I especially love the silicone muffin tins because you can simply pop the muffins out without worrying about them sticking to the pan. Nothing is more frustrating than trying to scrape off stuck on muffin bits from a pan when you barely have any spare time as it is! 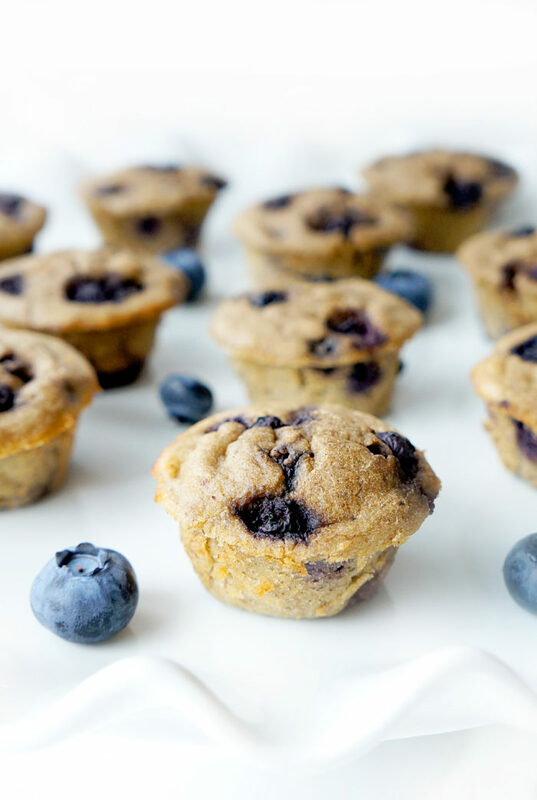 We had a whole bunch of over ripe frozen bananas just begging to be used (to the point where they were taking up a lot of freezer space) so I thought incorporating bananas would be a great way to sweeten up the muffins naturally without the addition of any sugar or sweeteners. Plus, the banana adds just the right amount of moisture to the muffins so that they’re soft and moist enough for a baby with no teeth to eat. 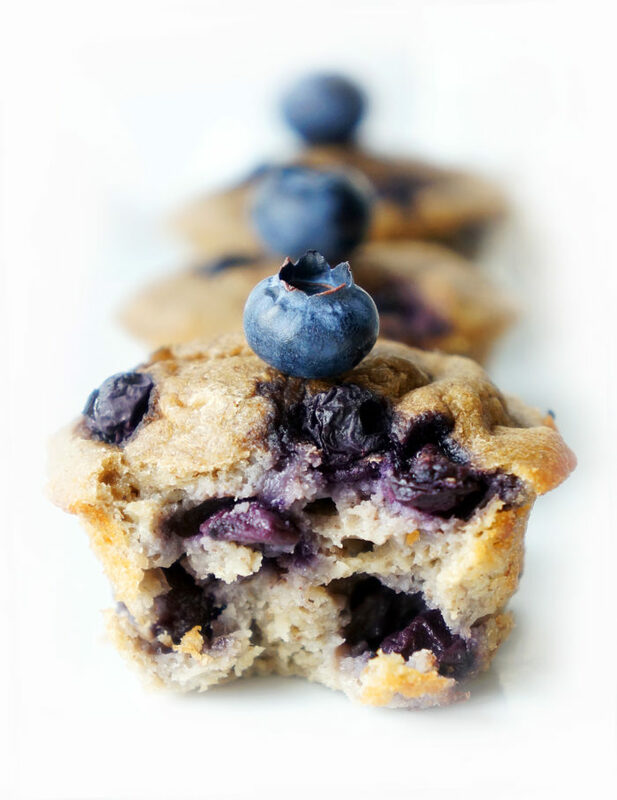 I decided to use wild frozen blueberries to add some extra texture and juiciness to the muffins. 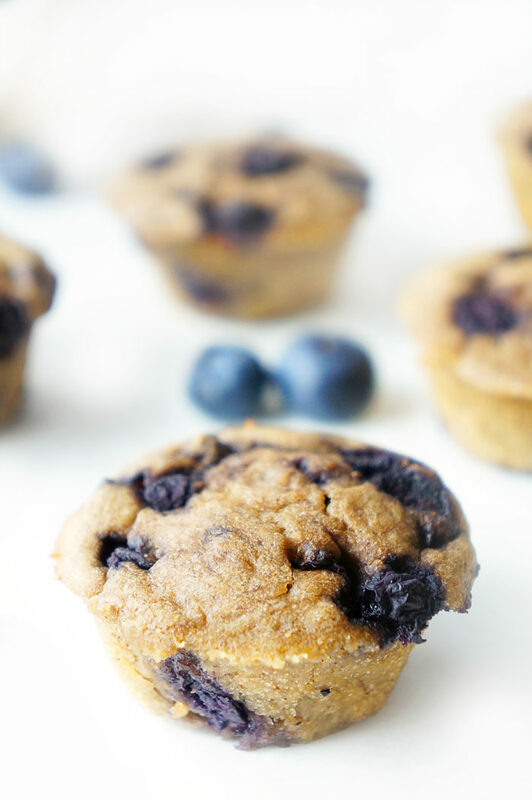 I chose wild for these particular muffins since they’re smaller in size and didn’t want to overwhelm the muffin with too many blueberries. 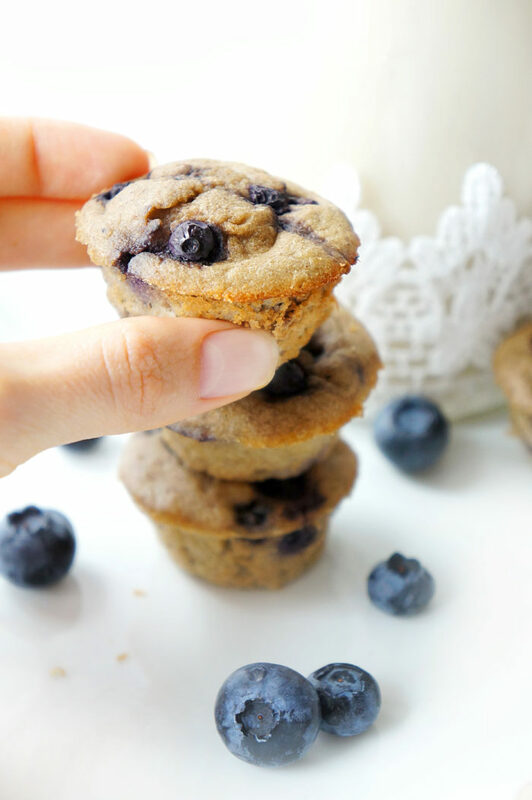 Because we all know muffins are easily overwhelmed :P The truth is, I didn’t want to overwhelm our baby with big honking blueberries! So the wild frozen ones were a perfect option! Initially, I tried the recipe with whole-wheat flour and they tasted alright, although I didn’t love the aftertaste. My husband and Leo didn’t seem to mind it though since they polished them all off! Gotta love them :) The next time, I subbed in oat flour, which you can either purchase at the store OR you can also make your own by blending up oats into a flour-like consistency in a blender. Either way, it’s a great way to incorporate the benefits of oats (like the soluble fibre, beta glucan and B vitamins) if your family members aren’t a huge fan of eating a plain bowl of oatmeal. Once the ingredients are all combined (which takes less than 10 minutes to whip together), simply pop them in the oven for about 15 min. You can store these mini muffins in an air-tight container for a couple of days in the fridge or better yet, freeze them! The recipe makes about 36 mini muffins so unless you can down all those muffins within a few days, I recommend storing them in the freezer to prevent them from going bad. 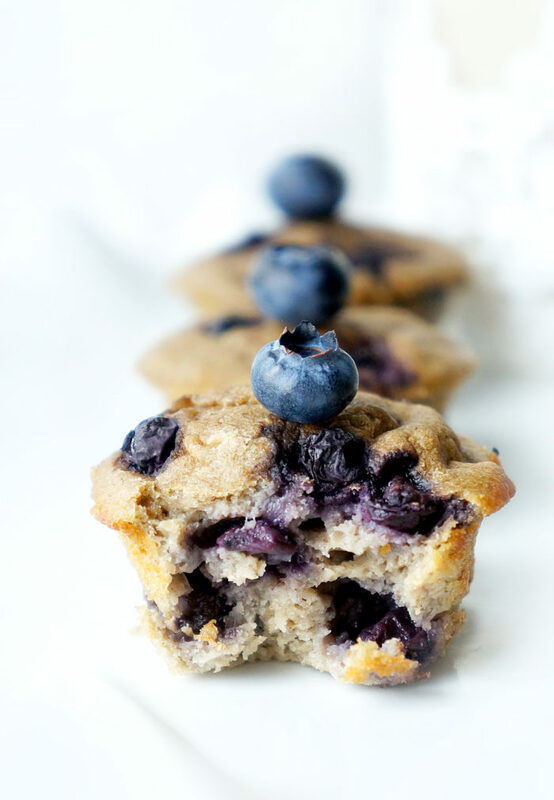 Don’t want these cute and tasty blueberry banana muffins going to waste! They make such a handy little snack or breakfast especially if you’re tight for time. Wouldn’t they also make a great back to school lunch box option too?! In a medium-sized bowl, mix together oat flour, cinnamon and baking powder (and salt, if using). In separate bowl, mash bananas using a fork. Add eggs, milk, and vanilla extract (and maple syrup, if using) and whisk together. Pour wet ingredients into dry ingredients and mix until combined (do not over mix). Gently fold in the the blueberries. Spray the mini muffin tin with cooking spray or use mini muffin liners. Divide mixture among 36 mini muffin cups (each cup should be filled close to the top). Bake in oven for about 15 minutes or until a toothpick inserted comes out clean. * You can make oat flour by blending oats in a blender until it reaches a flour-like consistency or purchase pre-made oat flour at the store. ** If preparing this recipe just for babies, I recommend leaving out the maple syrup and salt. For older children and adults, you may wish to add the syrup and salt to add some extra flavour as they are not overly sweet.